This is the recent talk I gave at an internal Training Day for developers of Swedbank. Although Swedbank Estonia (formely Hansabank) has the best Internet bank in the region according to Global Finance Magazine, we still strive to develop our usability and user interface skills. The talk was well received and was accompanied with some very nice slides, outlining the history of user interfaces, publicly available HIG documents, usability factors, comm0n design principles and other important points. Therefore it is worth reading for getting a compact introduction to the topic. This time I tried using a minimalistic style for the slides without any (possibly) distracting backgrounds, inspired by Neal Ford's excellent talk "Ancient Philosophers & Blowhard Jamrobees" from the Agile 2008 conference. Neal's slides are mostly back with some nice stock pictures and maybe a few words; they help him talk and not just read what is written on the screen. This helps the listeners to concentrate on the performance of the speaker instead of being distracted by reading, and pictures help to visualise the concept, greatly increasing the influence on the audience. Of course, this kind of presentations need lots of skills and rehearsal from the speaker. Anyway, I hope that my slides will be useful and can at least spark some interest for researching this ultra important topic further. 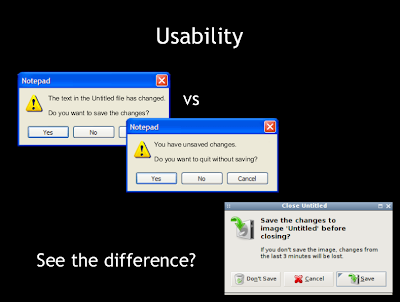 There are too many crappy user interfaces out there, so developers, keep this in mind! Is the scanning of computer networks dangerous?